It’s that time of year again, when our phones start ringing off the hook with requests for last-minute appointments to get dental treatment before the money disappears. So fair warning – CALL NOW if you don’t want to lose out! If you’re a procrastinator-type person when it comes to dental care, no worries, you’re not alone! Unless there is pain involved, dental work doesn’t seem very urgent, but not getting treatment done before the end of the year can result in a totally different pain……the pain of throwing away money! 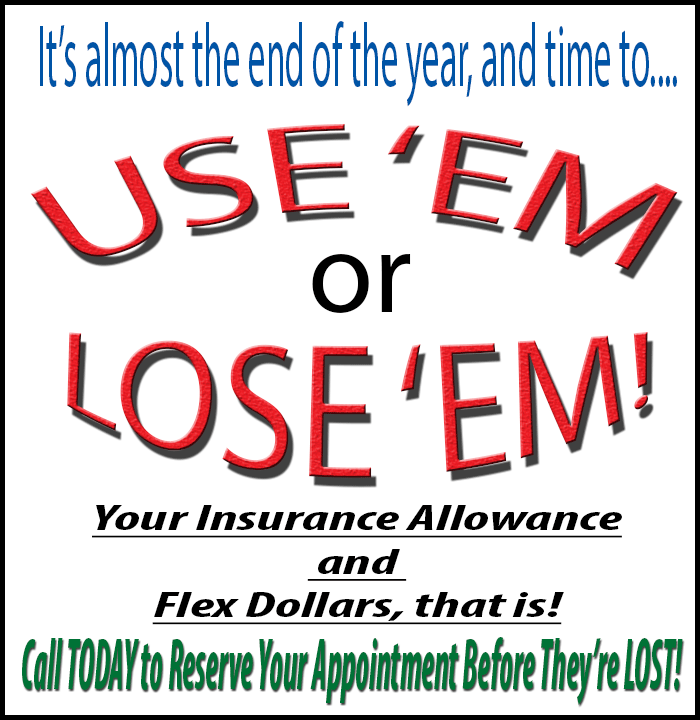 No one likes to lose money, but that’s what happens when your insurance year runs out, or when you don’t use the flex dollars you already set aside. Insurance benefits don’t roll over to the next year, and crazy as it seems, even though flex dollars are YOUR money that you set aside, if you don’t use them, your employer gets that money back, not you. Regardless of your politics or what you think of Obamacare, the simple fact is that the amount you can set aside for a Flex Account in 2013 will be cut by HALF. I don’t understand the reasons behind this in the least, but that’s what is going to happen. So this is the time to use what you have, because next year you can’t set aside as much. Our End of Year Schedule is Already Filling Up! PLEASE call now 704-364-7069 to schedule before it’s too late.